This funny Netflix cartoon with kooky animal characters manages to juggle absurdist comedy, cutting meta-commentary and perhaps the most accurate depictions of mental health issues in current media. 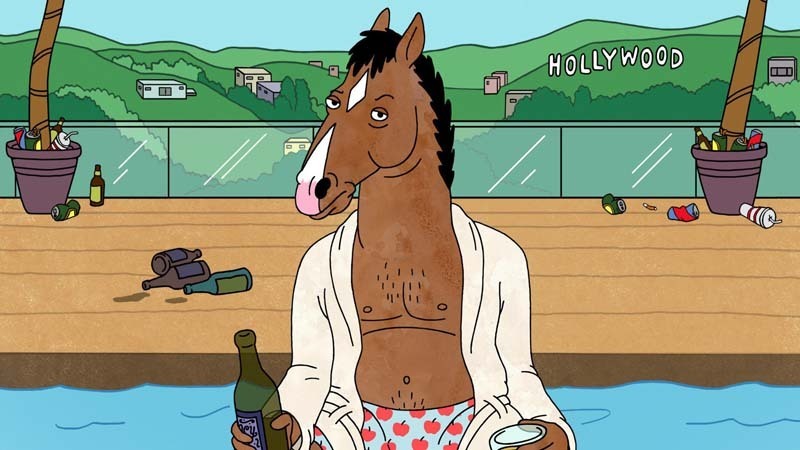 The fifth season opens with the titular Hollywood equestrian (voiced by Will Arnett) filming a gritty, and pretentious, detective drama called ‘Philbert’. The parallels between BoJack’s life and his role in Philbert are purposefully on the nose and demonstrates an interesting dynamic, especially in the episodes ‘INT.SUB’ and ‘The Showstopper’. Philbert is the setting for the majority of the season’s plot, starting with conflict between BoJack and the obnoxious showrunner, Flip (voiced by Rami Malek), and culminating with an on set incident that effectively wraps together all the seasons key themes. As in the previous seasons, themes like addiction and fragile mental health are foregrounded but specifically we see the show question things like the importance of the truth, the viability of self-help and people’s ability to meaningfully change. In particular, this season’s social commentary has become even more brazent than its predecessors. The episode ‘BoJack the Feminist’ is the best and most prominent example of this, where we see the show explain the damaging effect that mainstream media’s forgetful and forgiving attitude towards toxic characters. Although it’s not just the show’s meta narrative that has developed, many of the characters have too. Unfortunately for the titular character, this development is not a positive one, at least not in the context of the show’s reality. To anyone who’s watched the show to season four, it should be apparent that BoJack is simply the protagonist and not any sort of hero or really even a decent guy (an idea the show pushes rather blatantly). We see him start the season by taking a few tentative steps to improve himself but by the finale, we’ve seen him sink to the lowest we’ve ever seen him. Both his actions and responses to them not only drained what little goodwill I had for him as a character but made me question whether he can even redeem himself in any way. However, like the ones before it, I left the season intrigued to see where his character is taken for the next season. BoJack isn’t the only character that changes this season, Mr Peanutbutter (voiced by Paul F. Tompkins) really comes into his own as he tries to navigate his newfound divorced life with a personal favourite episode being ‘Mr Peanutbutter’s Boo’s’, where we see an interwoven story of him attending the same Halloween party four times over a period of 25 years. Plus, this season’s seemingly obligatory flashback episode centres on Princess Caroline (voiced by Amy Sedaris) which gives some good context to her motivations as a character. Despite some serious subject matter though, the show’s comedy is as sharp as ever. Todd’s (voiced by Aaron Paul) hijinxs with a character named Henry Fondle might just have the funniest subplot I’ve seen in the show ever. The visuals don’t disappoint either; the established busy shots littered with punny references and sight gags are ever present, with some really creative visuals being employed, especially in the penultimate episode. However perhaps one of the most memorable episodes of the season doesn’t have any eye-catching elements. ‘Free Churro’, in direct contrast with season three standout ‘Fish Out Of Water’, is almost entirely comprised of BoJack delivering a eulogy. Making a stark twenty-minute monologue in an animated show is a testament to the show’s solid writing. BoJack Horseman, over its previous four seasons, has created a fine balance between tragedy and comedy; the real and the surreal; characters and commentary. Season five doesn’t only maintain this balance but also delivers the tightest and most focused episodes the show has seen to date.